55-3287 at RAF Northolt - EGWU, United Kingdom. 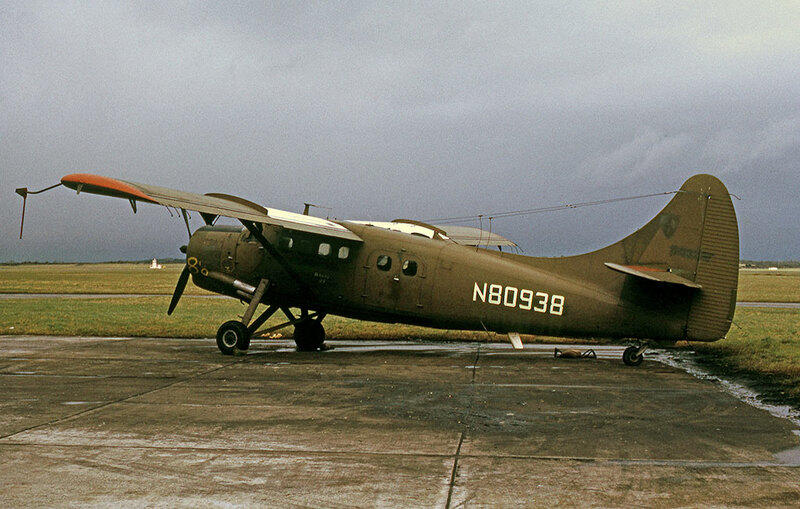 N80938 at Shannon - EINN, Ireland. CF-AOO at Lac Mance, Québec. Entries preceded by date are notes compiled by Karl Hayes from US Army sources. Jun/Jul to Brookley AFB, Mobile, AL. Here the aircraft was loaded on board a ship serving with the Military Sea Transportation Service, which set sail for Bremerhaven, Germany arriving on 26-Jul-1957. Jul-1957. 2nd Aviation Company based at Illesheim, Germany until Jul-1959 when the unit moved to France. The Company headquarters of the 2nd Aviation Company and one platoon were based at Orléans a second platoon at Verdun and a third platoon at Poitiers. During its time in France the aircraft was either based at or visited all three locations for different levels of maintenance. Note: Ian Macdonald mentions that “amongst the paperwork for this aircraft, held at the Canadian Department of Transport archives, is a partial summary of maintenance events extracted from US Army records. These allow some extra snapshots of its whereabouts and time on the airframe on certain dates”. Notes are as written on file. Oct-1962. Assigned to 207th Aviation Company, Heidelberg, Germany. Jan-1964. Transferred to the 394th Transportation Battalion, Germany. Feb-1966. Re-joined the 394th Transportation Battalion, Germany. 28-Jun-1966 (Entered by 17th Signal Battalion, APO 09164) [work on elevator control rod]. 06-Oct-1966 (still with 17th Sig Battalion). Note: Other source quotes 17th Sig Batt. was “inactivated” 25-Sep-1965. 20-Feb-1968 (Entered by SCCE Aviation Company) [work on wiring]. 01-Jun-1968 (still with SCCE Avn Co). 13-Aug-1968 (still with A (or S) CCE Avn Co). 28-Jan-1969 (still with SCCE Avn Co). Sep-1969. Coleman Barracks Depot, Mannheim, Germany. Oct-1969. Assigned to the 56th Aviation Detachment, also based at Coleman Barracks, Mannheim, Germany. Aug-1971. Withdrawn from use and put into open storage at Coleman Barracks. It was deleted from the Army inventory in October 1971 and put up for disposal. Total time: 4,468 hours at 16-Feb-1971. The entries below, preceded by dates, are extracts from the Canadian Department of Transport archives . 22-Mar-1972 Bill of Sale; Ferrer Aviation to St-Louis Aviation Inc., St-Jean QC. 23-Mar-1972 Allotment of CF-AOO to DHC-3 msn 137 for La Sarre Air Services Ltd., La Sarre, QC. No date Purchased in Germany by Ferrer Aviation and ferried to St-Jean, QC, 42 hours ferry time. 24-Mar-1972 DHC-3 msn 137, N80938, cancelled from USCAR. 07-Apr-1972 Bill of Sale; St-Louis Aviation Inc to La Sarre Air Services Ltd., Las Sarre, QC. 07-Apr-1972 Application for Certificate of Registration by La Sarre Air Services Ltd.
11-Apr-1972 Test flown for Certificate of Airworthiness. 16-May-1972 Certificate of Registration issued to La Sarre Air Services Ltd., La Sarre, QC. • CF-AOO La Sarre Air Services Ltd, La Sarre, QC. Regd 16-May-1972. Accident: Lake Atilla, Fort George, QC. 50.30N/77.38W 12-Jul-1974. En route to Lake Brisay, supporting construction of the LG-2 hydro plant the aircraft failed to maintain altitude after take-off, crashed into a wooded area and was destroyed by fire., The pilot, George Caron and crewman Normand Cote seriously injured; two passengers received minor injuries They were rescued by a helicopter from the nearby construction camp. A Canadair CL-215 fire bomber was called in to put out the fire started by the Otter crash. As the accident report summarised: “Aircraft not properly loaded; collided with trees on take-off; aircraft destroyed”. Total time since new as recorded in the Canadian Department of Transport archives. 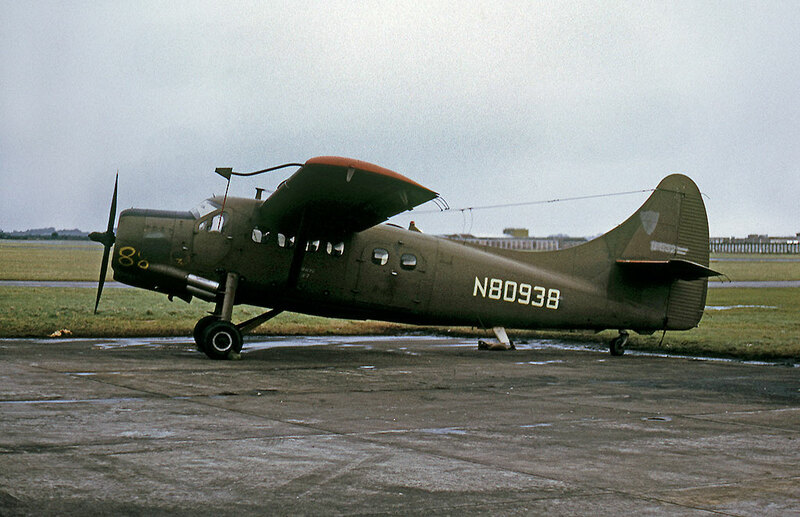 Otter 137 was delivered to the United States Army on 3rd July 1956 with serial 55-3287 (tail number 53287). 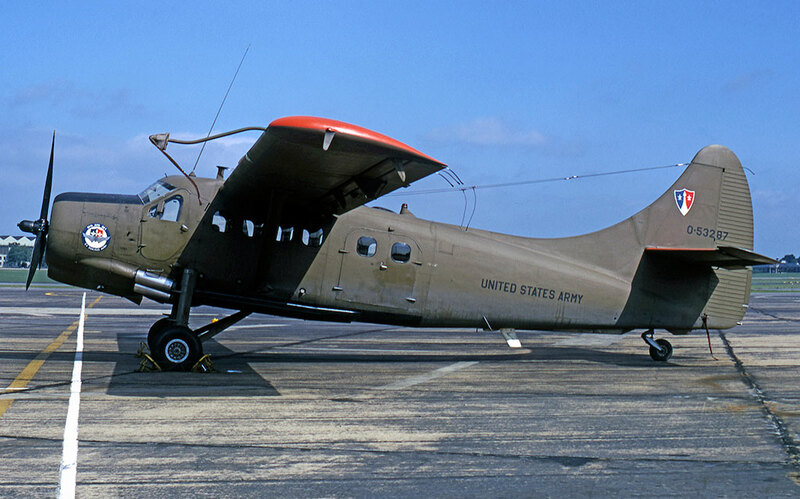 It was assigned to the 2nd Aviation Company, Fort Riley, Kansas which later deployed to Germany, then France (as described in relation to Otter 124). Historical records show 53287 to have been dis-assembled on 20th May 1957 for shipment overseas and arriving with the 2nd Aviation Company, Illesheim, Germany on 26th July '57. On 1st February 1958 it arrived at the SABCA Company, Gosselies Airfield, Belgium, who peformed overhauls on Otter aircraft for the Army, its total airframe time at that stage being 559 hours. It was back with SABCA on 17th April '62, still operated by the 2nd Aviation Company, by which stage its total time had increased to 2,158 hours. It remained at Gosselies until September '62 and the following month was assigned to the 207th Aviation Company, Heidelberg, Germany where it continued to serve until January 1964, when it was transferred to the 394th Transportation Battalion, Germany. It was to spend its entire Army career based in Europe. England on 18th November '69. It received its final overhaul in Army service during July 1970 from the 582nd Transportation Company at Coleman Barracks and continued flying for the 56th Aviation Detachment until August 1971, when it was withdrawn from use and put into open storage at Coleman Barracks. It was deleted from the Army inventory in October 1971 and put up for disposal. It was one of eight Army Otters, all in storage at Coleman Barracks, put up for sale by Sealed Bid Tender with a closing date of 29th December '71, the disposal having been entrusted to the USAFE Redistribution & Marketing Center, Mainz-Kastel, Germany. The successful bidder for all eight aircraft was Ferrer Aviation Inc of Miami, Florida, the total price for all eight Otters being $303,640, of which $33,800 was the price for 53287, which at that stage had 4,426 hours on the airframe. Ferrer Aviation Inc., was the company of Frank Ferrer, whose first Otter was CF-GCV (2) which he had retrieved from the icy wastes of the Labrador Sea in 1959, and who had been dealing in Otters ever since. Ferrer Aviation contracted aircraft ferry company Air Convoy to fly the eight Otters to Canada, which took place between February and April 1972. On 2nd February '72 civilian registrations were applied for from the FAA for the eight Otters, 53287 being allocated N80938. The aircraft were flown, two at a time, routing from Coleman Barracks via Saarbrucken, Germany to Ashford in Kent and on to Shannon, Ireland. These Otters were all in their Army olive drab, looking somewhat the worse for wear after months of outside storage, with their Army tail numbers blanked out and the civilian N numbers applied. The first two Otters to arrive at Shannon on 23rd February '72 were N80938 (formerly 53287) and N80940 (formerly 53292). At Shannon, ferry tanks were installed by SRS Aviation, after which the Otters set off for the long Atlantic crossing, first stop Reykjavik, Iceland and then via Greenland, to Goose Bay, Labrador. All eight aircraft successfully made the ocean crossing. of La Sarre, Quebec on 7th April '72 and received its Canadian Certificate of Airworthiness on 11th April, then entering service with its new owners. N80940 was also sold to La Sarre Air Service, becoming CF-AON. CF-AOO flew for La Sarre Air Service until it was destroyed in an accident on 12th July 1974. 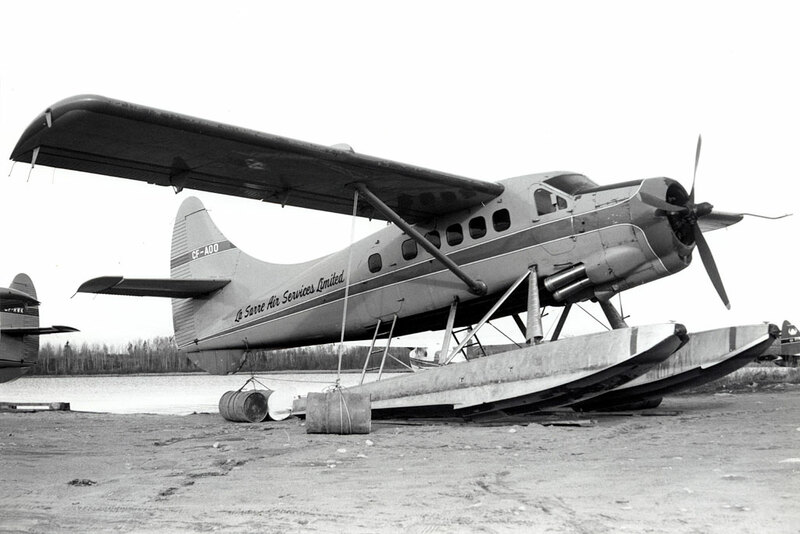 The float-equipped Otter was taking off from Lake Atilla, Fort George, in northern Quebec en route to Lake Brisay, supporting construction of the LG-2 hydro plant. It failed to maintain altitude after takeoff, crashed into a wooded area and was destroyed by fire. There were two souls on board, the pilot being seriously injured. They were rescued by a helicopter from the nearby construction camp. A Canadair CL-215 fire bomber was called in to put out the fire started by the Otter crash. As the accident report summarised: “Aircraft not properly loaded; collided with trees on take-off; aircraft destroyed”. The registration was cancelled on 2nd May 1975.